Wait! I know what you’re thinking. 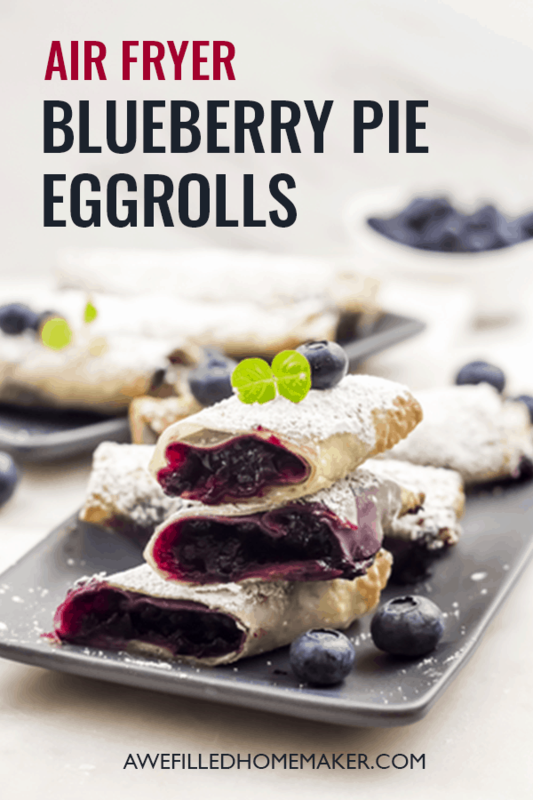 Blueberry pie and egg roll? Together? I can feel your excitement. This dish should get you excited because not only is it SOY FREE, it is also Vegan!!! 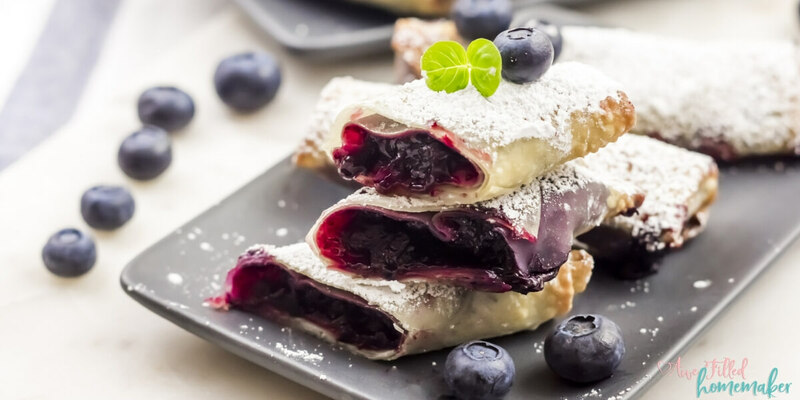 If you love delicious desserts, you won’t believe how amazing these Air Fryer Blueberry Pie Egg Rolls are. One bite and you’ll be hooked. In our house, we like desserts. Be even more than that, we like desserts that are simple and easy to make. 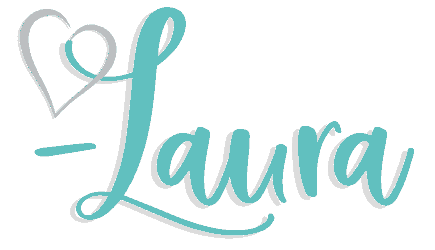 Did you know that you can make your Air Fryer work for you in a way that you maybe never thought possible? 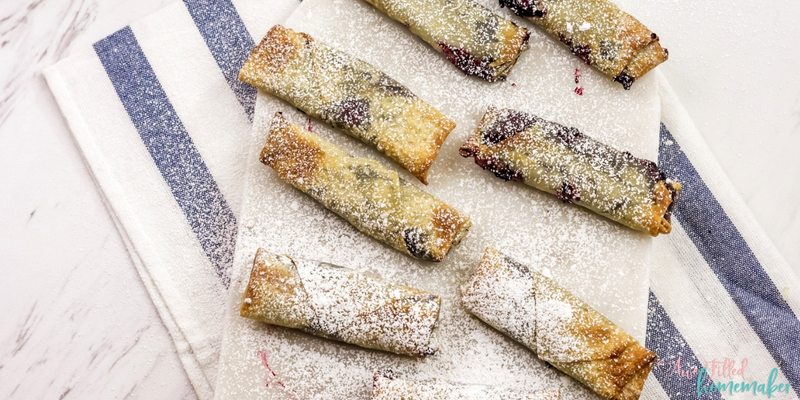 Yes, your Air Fryer can make delicious desserts. Mind blown, right? I can assure you that this will be a favorite on your dinner table after just one time. It’s simple to make and it’s unique, plus it tastes so delicious! 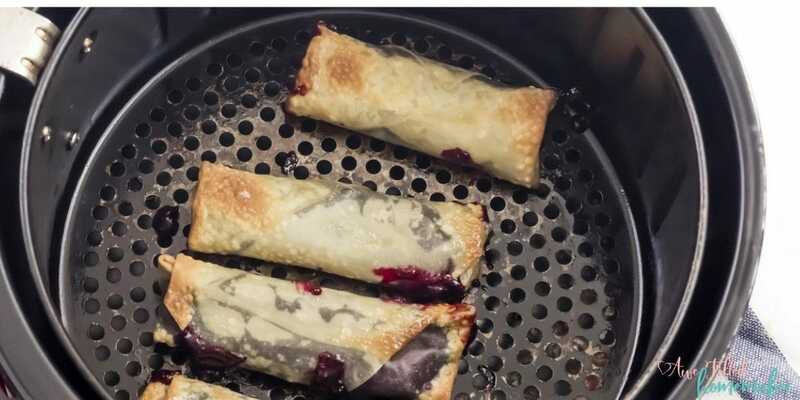 When should you serve these Air Fryer Blueberry Pie Egg Rolls? Here’s the deal. You can literally serve these anytime that you want, BUT I think that it’s a fun treat to save and serve at April Fools’ Day! 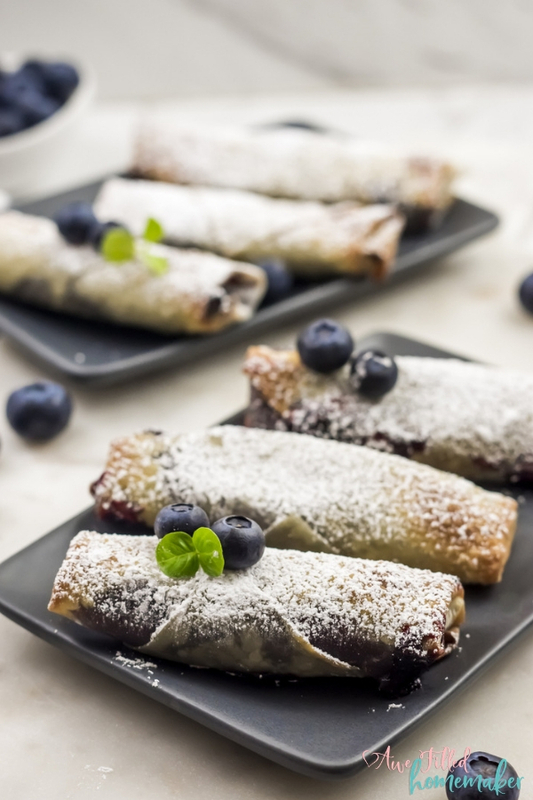 Make up these “egg rolls” and watch your kiddos surprise when they take a bite and taste blueberry! So much fun, right? And while they do make a fun treat for April 1st, they also are perfect for family meals and dinners as well. 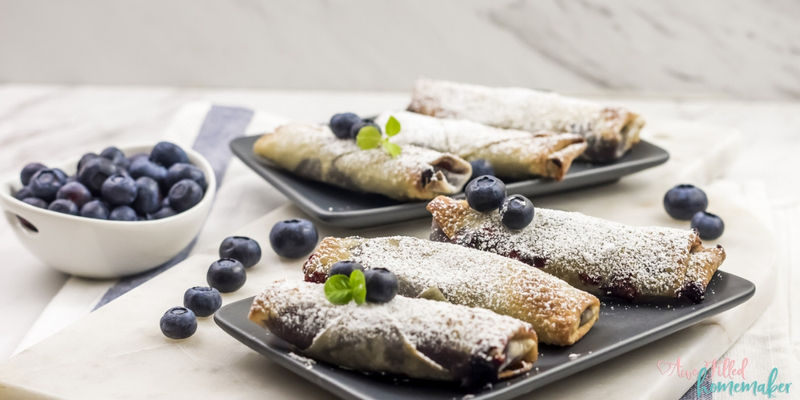 Can you use other fruit besides blueberries in these dessert egg rolls? Of course. 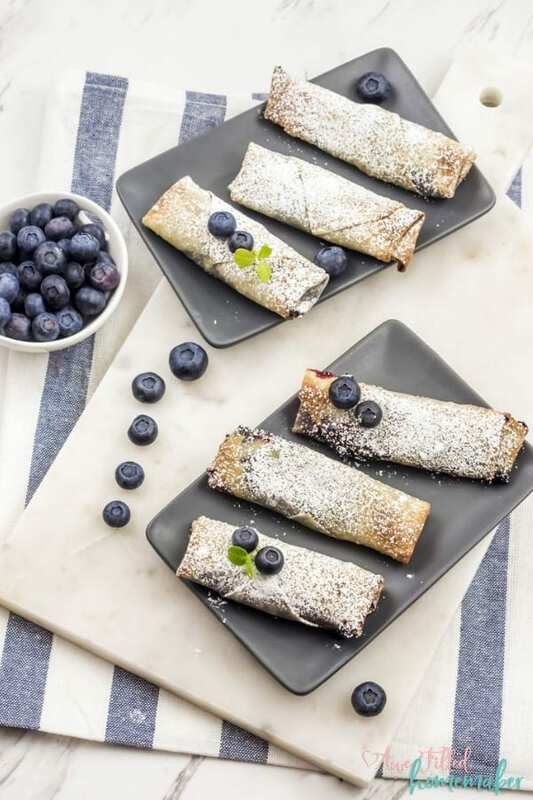 Blueberries are just one of our favorites, but if you have another fruit that you want to try, go ahead and do so! I would imagine that strawberry would taste really great as would pineapple or possibly even a fig of some sort. Just keep in mind that different fruits all have varying and different flavors so they may taste a bit different due to the additions of this recipe. 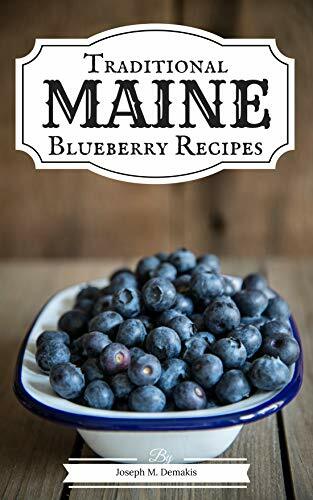 When you think about blueberries, what do you think is the best thing about them? Some might think that it is the taste. But there’s more to what meets the eye or, in this case, the taste buds. They are very low on calories and very high on nutrients! It also protects your cholesterol levels. Not many desserts are healthy, but this has the potential for good health written all over it. All of this with a hint of lemon makes this lunchtime dessert much more exciting. This excitement comes from the citric frenzy it creates on the tongue whilst eating these eggs rolls. It is nut free, too! That’s probably a good thing since it would make the taste and texture very awkward. Also, nuts contain a high number of calories and are fatty. This dessert is sure to be a hit at your next tea party, church luncheon, get together, or just because. My kids love this and so do we! It is okay to enjoy something every once in a while and this is much better for you than a lot of other desserts that are FULL of sugar. The effectiveness of Agave nectar makes it healthier. Recently we had a diabetic diagnosis in our house, also. My husband, which I will share more of his story soon, has added another element to our dietary restrictions. Agave nectar is one thing his nutritionist highly recommends. Therefore, diabetic patients, listen up. 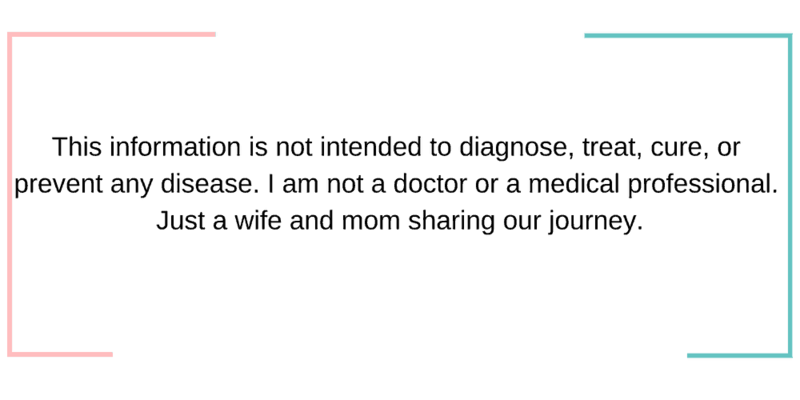 The prime reason why it is a better alternative to sugar is that it has a significantly low impact on blood sugar. Add this dish to your list of desserts that your health can afford to eat on occasion. Do you have to add in any oil to the Air Fryer for this recipe? While that is entirely up to you, I do a light spray of olive oil or butter spray (depending on what I have in the pantry) for this recipe. While it does add a bit more calories, I find that it also adds a little bit more crunch as well. (and we all know that egg rolls have to be crunchy, right?) 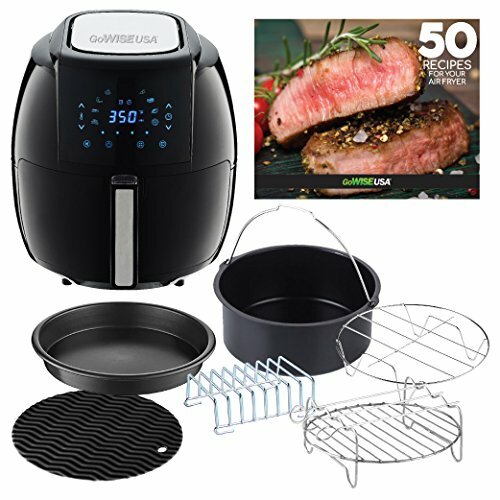 If you don’t want to add anything to your Air Fryer, you don’t have to but I do think that a little bit does help. I think this recipe is soon to be a favorite among my vegan readers. 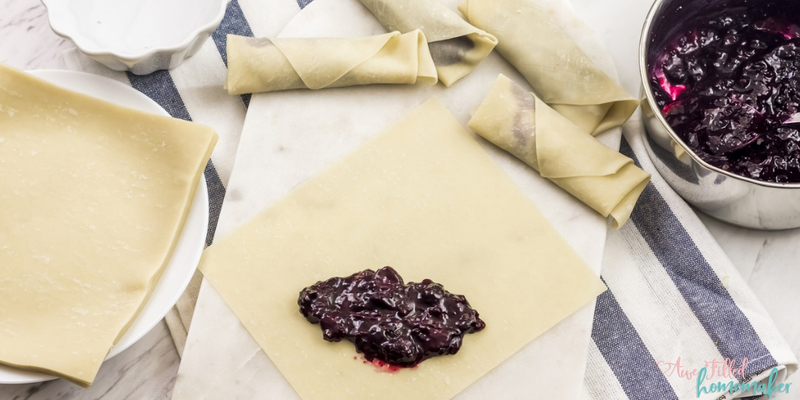 Instead of the conventional meaty fillings inside the egg roll, why not gift the world with this soy free, nut free, dairy free AND Vegan blueberry pie egg rolls? Like I have mentioned before, The Air Fryer produces a crispy egg roll without the addition of the oily residue. 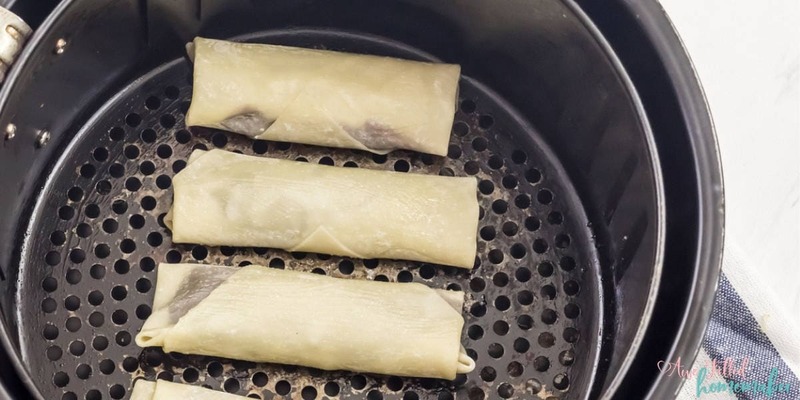 The air heating system of the Air Fryer cooks these egg rolls without the use of excess oil. A little olive oil or butter flavored cooking spray is enough. 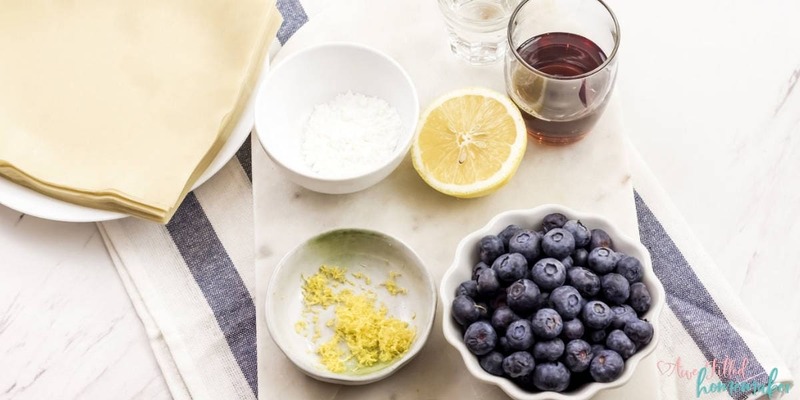 Everyone loves having blueberry pie for dessert. Why not make a little meal out of it? This nut free meal made almost exclusively for vegans who want to keep away from dairy products. It is made much healthier with the use of olive oil inside the Air Fryer which makes the outside shell a little crispy, but don’t be fooled! Wait for the sweet taste of blueberry to explode in your mouth. What is the best thing about Olive Oil? It is packed with numerous antioxidants that significantly reduces the amount of chronic and heart diseases. 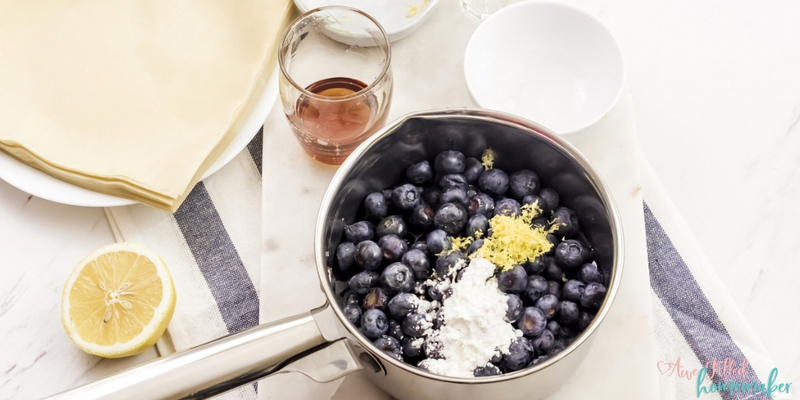 1) Combine the blueberries, water, agave nectar, lemon zest and cornstarch in a saucepan. 2) Stir it well so that the cornstarch gets dissolved in the water. 3) Bring it to a boil over medium-high heat. Reduce heat and simmer for 5 minutes, stirring occasionally, until berries start to break down and the sauce thickens. 4) Remove from heat and stir in the lemon juice. Keep aside to cool. 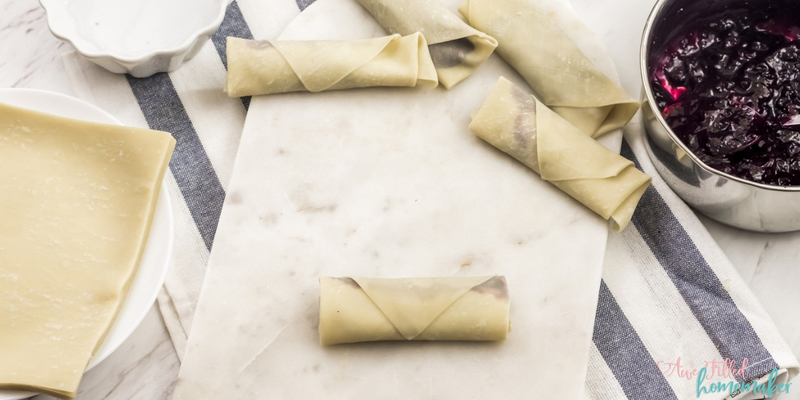 5) Now take an egg roll wrapper and place it diagonally in front. 6) Place about 2 tablespoons of the filling in the lower end of the wrapper. 7) Roll up the wrapper to halfway, then fold in the right and the left sides, like an envelope. Then roll to the very end, using a little water to seal the roll. 8) Repeat with the remaining wrappers. 9) Place few of the prepared rolls in the air fryer basket and spray very lightly with either olive oil or butter flavored cooking spray. 10) Air fry at 370F for 5 minutes. 11) Repeat with the remaining rolls. Lightly dust with confectioners sugar while the rolls are still hot. Keep in mind that the fruit on the inside of the egg roll will be very, very hot. 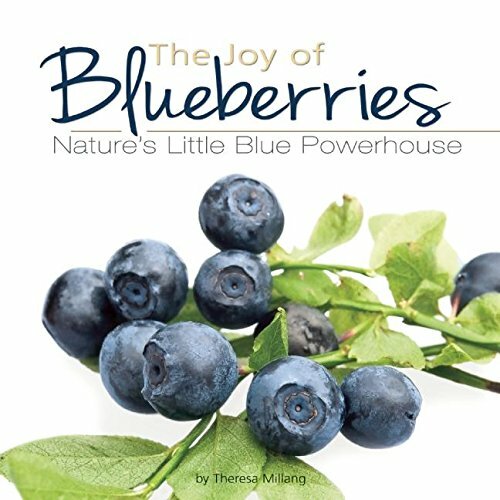 This is one thing that I always remind my kids about before they take a bite and it always tends to come as a surprise about how hot those blueberries can get! One other fun way to make this recipe truly special is to create it together in the kitchen. Finding a way to cook together is a great way to make memories and build that super strong bond for years to come. We all love to cook in our family so anytime there’s a recipe that we’re intrigued by, we all work together to make it and try it out! After all, the cooks ALWAYS get to be the first ones to taste their creations, right? And if that’s a motivator to get the kids to help out in the kitchen, who am I to complain? 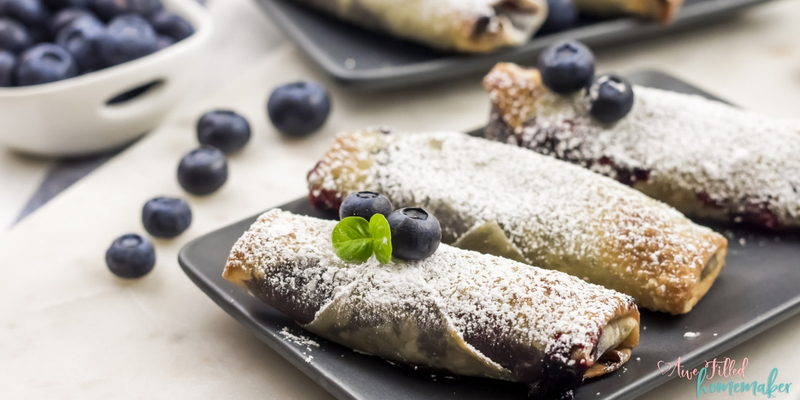 Have fun creating this delicious egg roll dessert recipe in your Air Fryer! You’ll truly love the crunchy sweetness of every single bite! That is it! This recipe is seriously that easy, but look how lovely it is! As lovely as it looks, it tastes even better! I was honestly shocked when I put this together at how good it did taste. We seriously loved every single bite. So I hope you enjoy a vegan, dairy free, nut free & soy free dessert. 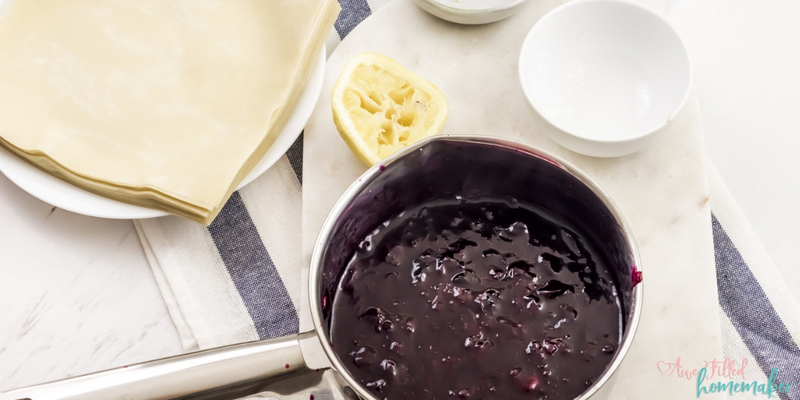 Combine the blueberries, water, agave nectar, lemon zest and cornstarch in a sauce pan. Stir it well so that the cornstarch gets dissolved in the water. Bring it to a boil over medium-high heat. Reduce heat the heat and simmer for 5 minutes, stirring occasionally, until berries start to break down and the sauce thickens. Take it off the heat and stir in the lemon juice. Keep aside to cool. 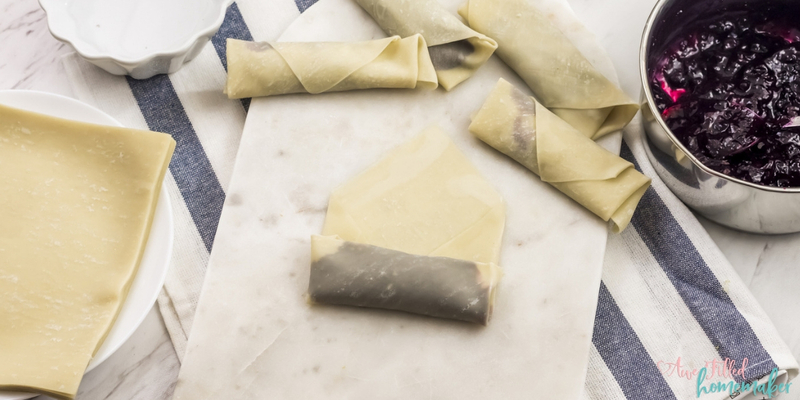 Now take an egg roll wrapper and place it diagonally in front. 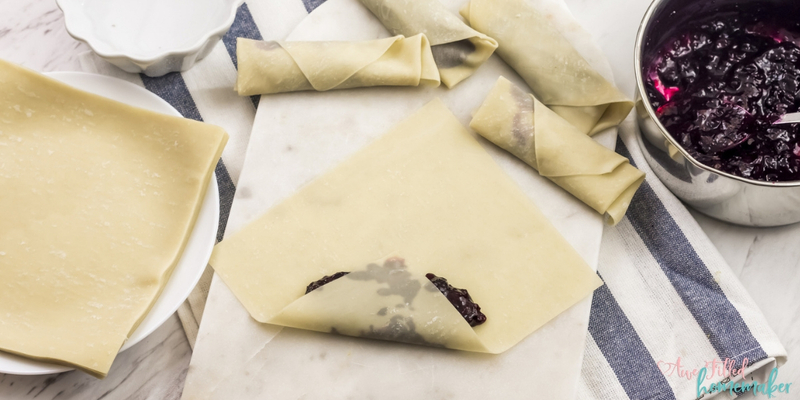 Place about 2 tablespoons of the filling in the lower end of the wrapper. Roll up the wrapper to halfway, then fold in the right and the left sides, like an envelope. Then roll to the very end, using a little water to seal the roll. Repeat with the remaining wrappers. Place few of the prepared rolls in the air fryer basket and spray very lightly with either olive oil or butter flavored cooking spray. Air fry at 37F for 5 minutes. Repeat with the remaining rolls. Lightly dust with confectioner’s sugar while the rolls are still hot.